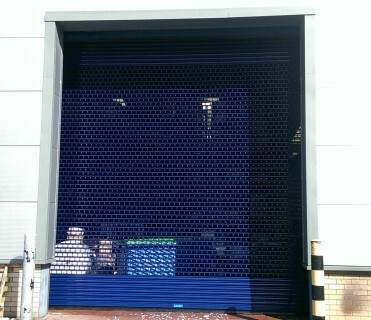 System 2000 have manufactured and installed some of the world’s largest roller shutter doors. Individually designed doors can be manufactured up to 30m. 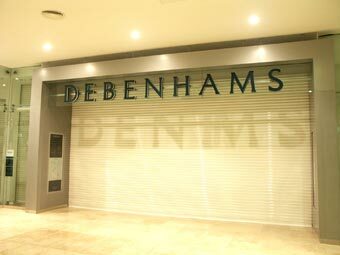 We specialise in high security roller shutters designed to secure and protect commercial, industrial and retail premises. 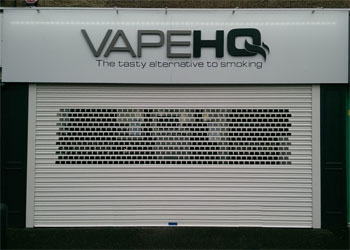 Our roller shutters are suitable for a wide variety of applications from entranceways, display windows and apertures of all types and sizes. 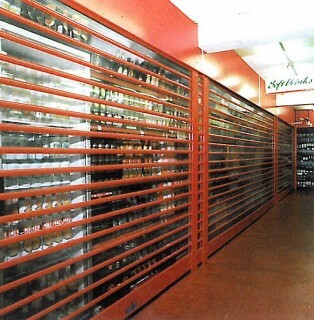 We produce steel and aluminium roller shutter door and grille systems. These are designed and manufactured to your individual requirements and are available in a full range of colours to accommodate the aesthetics of any building, shopping mall, retail premises, commercial or industrial property whilst ensuring the exacting demands for high security. Natural mill, powder coat or anodised finishes are available with the option of multi colour bespoke punched logos. 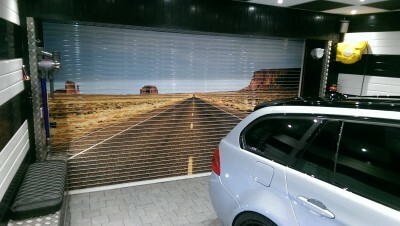 Vinyl wrapping is also available for a highly striking effect. Roller Shutters and Grilles can be manufactured from steel or aluminium cold-rolled or heavy-duty extruded sections to BS1774: 1987 from HE9TF aluminium. Reverse-coil application ensures that the correct profile face is always shown, and that each lath section slides together and is held tight by an endlock system, which is riveted directly to every alternate lath to prevent sideways movement. Because of our unique anti pullout and endlocking system, the laths cannot be forced out once entered into the specially constructed side guide. We can also supply polycarbonate roller shutters for interior and exterior use. 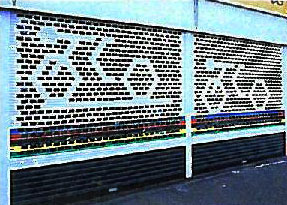 Alternative patterns, such as the bicycles shown are also available. It is possible to paint lath different colours for a striking effect. Insulated roller shutter doors are ideal where energy conservation or noise reduction must be a consideration. 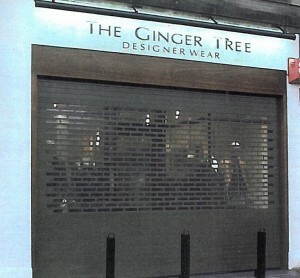 We also provide and install fire resistant roller shutters. Shutters can be manufactured to nearly any size – please contact us and we will do our best to meet your requirements. As a result of the ever increasing number of ram raid attacks, System 2000 Group designed a unique anti ram raid security shutter solution to be used in conjunction with its auxiliary equipment, to secure and protect not only products but the premises themselves. System 2000 Group designs, manufactures and installs anti-ram raid security shutters and grilles to Home Office recommendations, helping to combat crime. Every box lath contains two high tensile steel rods running through the entire length of the lath and through the dedicated endlocks and steel anchor system. Each rod has a bursting strength of 2.4 tons. Should the shutter be subjected to ram-raid attack, the laths and stainless steel rods will interlock into the dedicated guide system, energy absorbing guide fixings and steel subframe. This dramatically reduces sheer loading and the curtain flexes, bringing the vehicle to a halt. The System 2000 Group roller shutter curtain is already inherently 40% stronger than conventional extruded sections with composite materials. Options include stainless steel anti-cut rods, bespoke locking systems and anti-ram raid bollards – fixed, removable or telescopic – automatic or manual. We also supply high speed automated roller shutters. 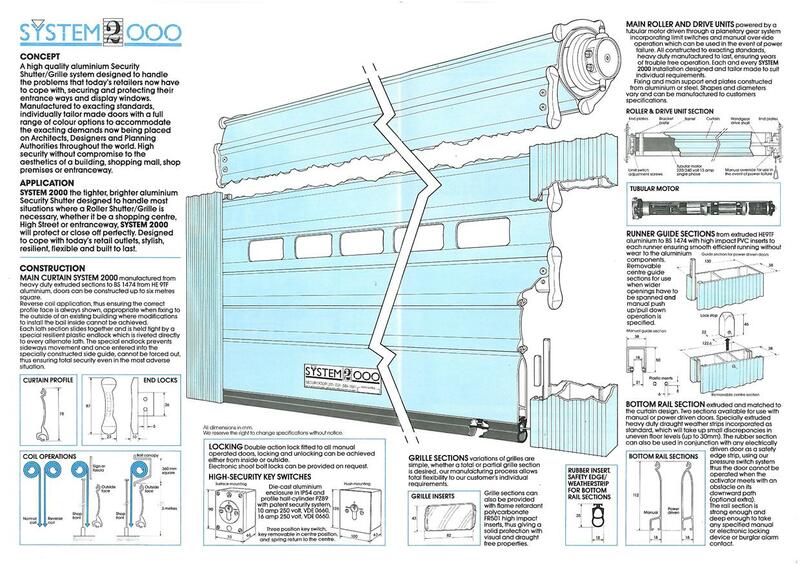 The System 2000 High Speed Rapidor is a fully automated door that is activated using a range of different options. The System 2000 Door Controller allows all functions to be controlled and monitored including fault diagnosis and warning systems, controlled through a PC board or standard System 2000 control panel. The main curtain is constructed from high strength, monofilament panels, purpose designed to act against wind pressure, incorporating wind endlock system where applicable. The bottom rail system is manufactured with full safety edge strip and neoprene weatherseal. Motor drive assembly and three phase, two speed, heavy-duty motor drive unit with integrated braking system and limit switches. The main self-supporting framework is built to house the curtain tensioning system and self supports the main heavy-duty steel roller assembly. Weather brush strips can be added as an optional extra. All metal covers are pre-finished galvanised, designed to give a long lasting life cycle, which is necessary with all high-speed doors. Door panels are Blue/Orange as a standard, with the option to have transparent PVC vision panels inserted. Safety features include: bottom rail safety edge, photo electric beams, ground floor loops for safety and activation, remote control operation, timer return controls or manual push-button controls. In addition we can provide and install PVC crash/strip doors. Sliding Folding Doors stack neatly to the side of the door opening, take up very little headroom and are particularly suitable for use in wide openings.